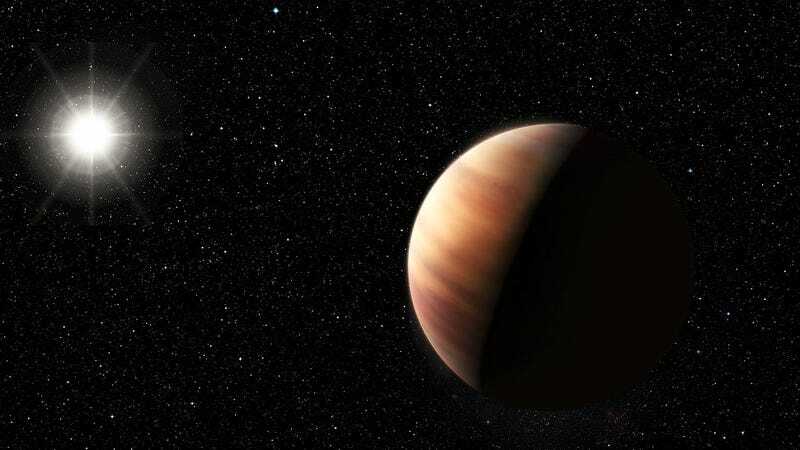 An international team of astronomers has detected a planet very similar to Jupiter orbiting at the same distance from a Sun-like star. And because the age and chemical composition of this system is similar to our own, it likely features an inner collection of rocky planets. Call it solar system 2.0. Ever since the first exoplanet was discovered in the 1990s, astronomers have increasingly come to realize that our solar system is unique. Yes, it may be the result of a selectional effect, but most solar systems feature an inner region populated by massive planets, including hot super-Jupiters and terrestrial super-Earths. This runs in stark contrast to our own solar system, which features a set of inner terrestrial planets and a middle region populated by gas giants. Some astrobiologists speculate that this planetary orientation may be a major contributor to Earth’s habitability; our solar system’s habitable zone is buffeted by an outer shield of gravitationally heavy gas giants. What’s more, the absence of inner gas giants is what allows for the presence of inner rocky planets. That’s what makes the discovery of an apparent solar twin so exciting. This chart shows most of the naked eye stars visible in the large but faint constellation of Cetus (The Whale). The location of the star HIP 11915 is marked with a red circle. It is too faint to be seen without optical aid, but can be picked up with binoculars. Caption and image credit: ESO/IAU and Sky & Telescope. Located 186 light-years away in the constellation of Cetus (The Whale), star HIP 11915 was analyzed by a Brazilian-led team using the HARPS planet-find tool mounted on the ESO’s 3.6-meter telescope. Though many Jupiter-like planets have been discovered before, this one is remarkably similar both in terms of its mass and proximity to its host star. The Jupiter-like planet features a 3,600-day orbital period (10 years) and low orbital eccentricity. Jupiter, by contrast, features a 4,380 day orbital period (12 years). What’s more, the chemical composition of HIP 11915 is similar to the Sun’s. Astronomers are thus hopeful that this solar system hosts a set of inner terrestrial planets, though further work is required to bear this out.